In April 2012, I wrote a blog article entitled Who is Kenneth C. Howard? The article arose out of two small notebooks which were contained within one of Josef Jakobs' files at the National Archives in Kew. 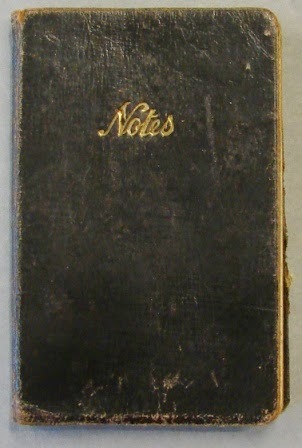 At the time, the notebooks (or facsimiles thereof) were on display in the small curator's museum at the Archives. The notebooks have proved to be an ongoing conundrum. Neither of those descriptions match the two small notebooks at the National Archives. In fact, had those notebooks been in Josef's possession, the officers of MI5 would have questioned Josef rigorously about the Kenneth C. Howard to whom the notebooks belonged. The black notebook is about 2 inches by 3 inches. It is quite worn and has the English word "Notes" inscribed on the front. 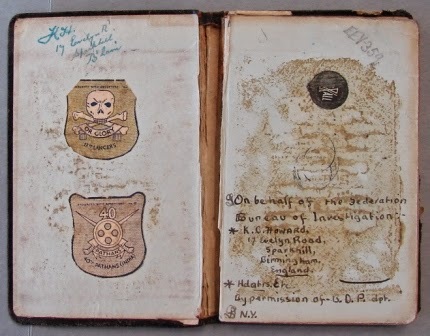 The inside front cover of the black notebook had two stickers of British regiments: the 17th Lancers (with skull and crossbones) and the 40th Pathans. Both regiments had been amalgamated with others in a general army reorganization in 1922. The number "1" is written in the English fashion, not the Continental fashion. By permission of B.D.P. dpt. A few pages farther along, we come to the page which the National Archives had on display in their little curator's museum. They clearly took this to be the most important page and indicative of Josef's allegiance. None of the handwriting resembles Josef's handwriting in any way. In fact, the notebook looks to be that of a young boy, a boy who imagines himself to be an agent of the F.B.I. (Federal Bureau of Investigation), although he doesn't even get the name right. 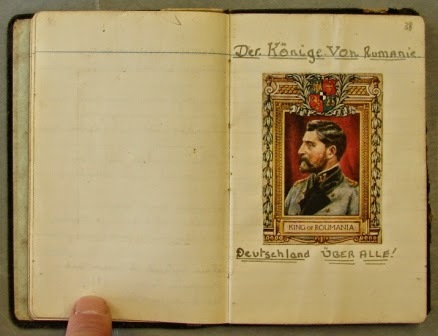 Clearly he does not know German either for the inscription below the picture of the King of Romania should read "Deutschland über Alles" (not Alle). I did not photograph every page of the black notebook when last I was in England, but I believe these three images make the point - this notebook was never a possession of Josef Jakobs. It is not contained within his list of possessions and there is every evidence that it was the property of a young boy. The blue notebook was about 2 inches by 3 inches. 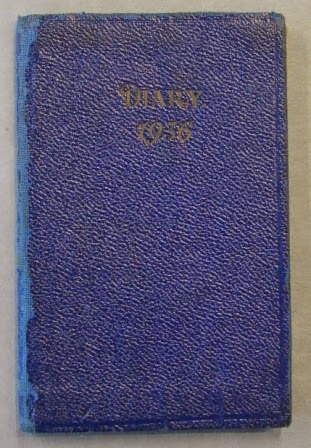 It was also rather worn with the words "Diary" and "1936" inscribed on the front. Again, I did not photograph each page of the notebook, but I think the first few pages speak for themselves. Address - 125 Durhams Rd., Bramley, Hants. Telephone No. - No Tel. The glove and shoe sizes are indicative of a child and are corroborated by the fact that this child has no telephone number or bank account. According to the blue notebook, Kenneth C. Howard was living in Bramley, Hampshire. During World War 2, Bramley was home to Bramley Camp, a large military ordnance base, protected by several anti-aircraft batteries. It is interesting to note that Kenneth's address in Birmingham was relatively close to Armoury Road and the Birmingham Small Arms factory. In fact, Birmingham had several factories that produced ammunition and weapons for the British Army. The two notebooks featured above were never listed in the possessions of Josef Jakobs. There was absolutely no evidence that Josef had any connections in Birmingham or Bramley. In addition, there is not a hint of Kenneth C. Howard in the MI5 files that relate to Josef Jakobs. There was, however, one spy who did have connections in Birmingham and that was Gosta Caroli who parachuted into England in early September 1940. He had spent time in Birmingham in 1938 and 1939 as an undercover journalist, feeding information on industrial sites back to Germany. Were these notebooks perhaps the property of Caroli? An MI5 note that accompanied the notebooks made reference to Birmingham police records. It may also be that the thinned MI5 files on Caroli reference these notebooks. In the meantime, one wonders about Kenneth C. Howard and his relationship to the spies of Germany. How did his notebooks end up in the National Archives in the files of Josef Jakobs? There is a Kenneth C Howard born to a Howard and Westerman between March and June 1926, in Bramley in Kent. Given the age of the child (he would be 10 in 1936), the childish hand writing and the Bramley connection it might be something. Wow - thanks - that is very helpful! The birth date hadn't registered. Might have to spend the £10 and see what the birth certificate says. To save the money if you have an ancestry subscription try running the names Charles Howard and Mary E Howard (I presume the mother of Kenneth) through the voters lists for Birmingham between 34-39 for the Sparkill area of Birmingham. They may also be under Warwickshire. The Uk had full emancipation 1930, so they should show up at the Bham address in the book, unless Kenneth was living with other family members. Potential time line help in the fact the FBI didn't receive that name until 1935, so the notes can't be any earlier than that. The Kenneth from free bmd was presumably the child of Charles Howard and Mary Eleanor Westerman. They married in Leeds, but she was born in Bramley, as was their second child, another boy. I do indeed have an Ancestry subscription and will take a look at the Birmingham voters lists. Thanks for the tips!